Media trials, under the guise of debates, have become the new normal today. 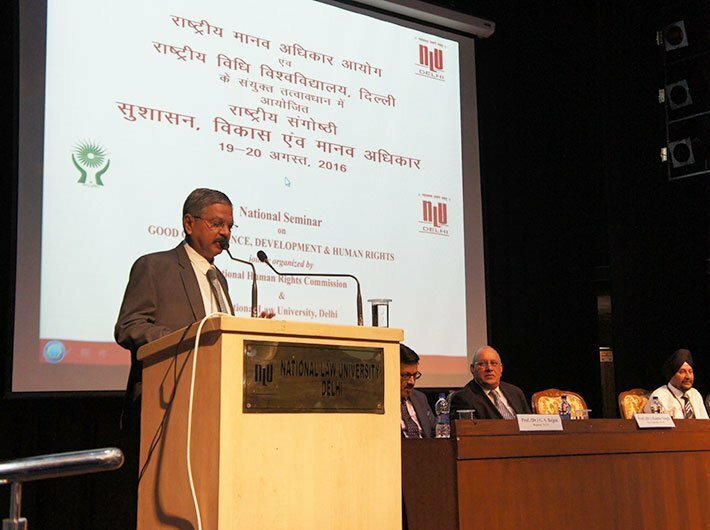 These ‘media debates’, which seem more like screaming matches, completely overlook the nuances of the issue being discussed, said justice HL Dattu, chairperson, National Human Rights Commission (NHRC) at a workshop in Bengaluru. Moreover, such debates often blur the fine line that separates an ‘accused’ from a ‘convict’, thus, bringing into question the golden legal principles of ‘presumption of innocence until proven guilty’ and ‘guilt beyond reasonable doubt’, he added, during the ‘Role of Media in Protection and Promotion of Human Rights’ workshop organised by NHRC, in collaboration with National Law School of India University (NLSIU), Bangalore, on June 22. The media, both electronic and print, play a vital role in protecting and promoting human rights in India by acting as the eyes and ears of our democracy. It has often been seen that journalists have come under attack from anti-social elements, sometimes in collusion with state and police authorities, who wish to prevent the truth of their misdemeanours to be disclosed in public. These attacks are condemnable for not only do they weaken the freedom of the media, but also significantly emasculate democratic processes. This issue needs to be taken up by all concerned governments so that the ‘voice of the society’ is protected. Today, the role of media extends not only to giving facts as news, but also analyses and comments on these facts, thus, shaping the views of the people. Unfortunately, in recent times mainstream media has often failed to reflect on some of the pressing challenges that confront marginalised sections, including Dalits, Adivasis, women, rural poor, urban poor, and workers in the organised and unorganised sectors, among others. It appears that only human rights violations committed by the state and its various agencies against the urban elite and middle classes are now considered worthy of print space and airtime. This is a matter of deep concern. In this regard, I would however, like to applaud the efforts of the vernacular press as well as ‘alternative’ media, including social media, which continue to highlight important human rights issues from the ‘forgotten’ regions of the country. Credit also goes to certain sections of the mainstream media which provide space for reporting on human rights violations. Social media platforms such as Twitter, Facebook and others have become essential to free speech and expression in the digital age. Movements around the world have used internet-based platforms to communicate, organise, and share critical information. Several instances come to mind wherein instead of ‘mainstream’ media, it is these lesser known ‘alternative’ social media platforms, which have brought to light human rights violations, as well as inspiring stories of people from across the country who have actively challenged and won over many socio-economic and civil-political human rights challenges. One needn’t go too far back to recount examples of ‘media trials’ in India. Recent events in JNU, a central university of great national and international repute, and the role of a certain section of the media in whipping up public frenzy, which led to mob violence in court premises and even the threat of its use against the ‘accused’, as well as all those associated with JNU, is a pertinent case in point. A trial by media is the very antithesis of the rule of law, and it may lead to a gross miscarriage of justice. A free press is the sine qua non of a democratic society and is a bulwark of freedom of speech and expression and freedom of information. But the question arises, how far is it right to manipulate the general public’s mind towards a particular conclusion when the trials are still under process? This, I believe, is a matter of urgent concern, over which the media has to ponder in earnest, so that it does not end up undoing the vital progress that has been made in the arena of human rights. To become genuine protectors of human rights, the media will have to steer clear of sensationalism and provocative journalism, which can cause considerable damage to not only concerned persons, but also vitiate the larger socio-cultural-religious relations in society. Insensitive and irresponsible reporting in the name of the ‘right to free expression’, far from protecting human rights, only creates and perpetuates numerous stereotypes. Let me conclude by saying that media has immense power to protect human rights and to address the various challenges that confront their effective realisation.